Daily Illuminator: Dungeon Fantasy Tips: Town? January 2, 2018: Dungeon Fantasy Tips: Town? 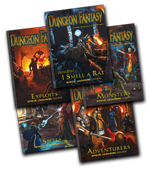 When one adventure leads to another, you have a Dungeon Fantasy Roleplaying Game campaign. That requires a setting, starting with the town heroes visit between dungeons. As GM, you'll find that planning this from Day One makes answering players' questions easier. Scenic view. Start with geography consistent with the delvers' skills. In particular, look at Survival specialties – the town's surroundings should feature those environments! If Boating, Fishing, Seamanship, and Swimming are common, locate the settlement next to an ocean, lake, or major river. If several heroes have Skiing, make the climate temperate to cool, or have mountains nearby. And so on. Population 101 99 107. Size matters, and skills are again a clue. If Filch, Gambling, Merchant, Panhandling, Pickpocket, Propaganda, Public Speaking, Streetwise, and Urban Survival are popular, offer a city where adventurers can wheel, deal, and steal. A preponderance of wilderness skills – Camouflage, Herb Lore, Naturalist, Survival, Tracking, etc. – suggests a more rural setting, so a village might work better. If there's a balance or an absence of the two, a mid-sized town is fine. Also consider the settlement's racial mix; if the party has many members of a race, make that race the majority or give it a large community in or near town. Many shops and churches. Regardless of size, town needs at least one inn where heroes can stay between adventures (usually at $150/week); one tavern where they can hear rumors; one store that buys and sells general merchandise for cash; one temple that offers healing (Exploits, pp. 62-63), charges clerical power items, and lets clerics exploit Clerical Investment; someplace shady where delvers can trade on the black market (Exploits, p. 13); and one establishment that deals in magic and charges wizardly power items, whether a Wizards' Guild hall or Ye Olde Magick Shoppe. In a village, these can be tiny or share space. In a true city, there might be several of each, with individual specialties – plus chapters of the Merchants', Thieves', and Wizards' Guilds. Access to goods and services. Adventurers also need to know what equipment and custom work these establishments offer for purchase. Heroes can start with whatever they can afford . . . but in play, fine-quality weapons and armor, heavy (DR 6+) armor, Special Orders (Adventurers, pp. 112-114), Concoctions (Adventurers, pp. 114-116), and Magic Items (Adventurers, pp. 116-118) may be harder to get, especially in smaller settlements. Consider assigning appearance rolls (Exploits, p. 12) to such goods: perhaps 6 or less in a village, 9 or less in a town, and 12 or less in a city. Certain gear might be bespoke, requiring time as well as money; the "weeks equal to DR" suggested for armor (Adventurers, p. 108) is an example. Similar advice applies to repairs, modifications, and adding enchantments (which could mean doing without the item for, say, a week per $1,000 of enchantment price). Safe. A city is likely to have a Town Watch as numerous as a modern police force, plus several squads of King's Men – and temples and guilds might have private security. A typical town has a Town Watch the size of a modern-day sheriff's department, with a few King's Men as "marshals." A village probably has a few part-time volunteers as its "Town Watch," but may be watched over by Rangers (similar to King's Men but specialized in wilderness survival and shooting things with arrows). This determines the response when delvers stoop to Scum and Villainy (Exploits, p. 14). Well-run. Most settlements have somebody in charge. In a city or large town, this might be members of the bourgeoisie. Smaller places usually turn to elders. Some fantasy societies are feudal despite having a powerful middle class, so any place bigger than a village may be run by a (true) knight or a baron, who has a stronghold in or just outside town; a city could have several such people, possibly rivals, or be governed by a duke or even the King. If the PCs are mostly clerics, holy warriors, and martial artists, make the authorities high-ranking priests and abbots. Famous for . . . Everything above could change if a town is famous for something. For instance, perhaps the place is notoriously expensive or cheap (costing more or less than $150/week to live in), or lawful or lawless (with more or fewer law-enforcers than its size suggests). Linking this to the heroes can help explain their presence: If you chose a city because the delvers boast criminal skills, the people in charge may be corrupt (the Thieves' Guild might pull the strings! ); if the party is spellcaster-heavy, consider making magic easier to come by; and if there are no clerics or holy warriors, maybe there's no temple. Geography can matter, too; mountains suggest mines, smiths, and access to fine metal weapons, while deep in the jungle, metal is scarce while fine wooden weapons and exotic poisons are plentiful. When rolling for what's available, this can mean modifiers, possibly even for specific items ("Alchemist's fire was invented here in Volcanoburg!"). Low unemployment. Include "hooks" to draw delvers into adventures. If you have several scenarios planned, think about Tavern Tales and Moldy Books (Exploits, p. 15) for each. Whether you do or not, decide who the quest-givers are: the owner of a certain inn or tavern, the baron, the high priest, some shadowy fellow in a cloak, etc. If some adventures will be urban, modify town to match, adding labyrinthine sewers, an evil temple, an Assassins' Guild, a lich posing as a taxpaying citizen, and so on. Friendly folks. The game is more immersive when key townsfolk have personalities and names. Such NPCs include the people in charge; chief law-enforcers, plus a few lesser ones who harass wandering adventurers; the senior priesthood; high-ranking guild members; proprietors and staff of inns, shops, and taverns; specialist craftspeople, like alchemists and enchanters; and anybody offering Exceptional Training (Exploits, p. 93). Quest-givers should never be anonymous unless they're cloaked drifters who disappear overnight. Thieves' Guild members and similar criminals are often anonymous, or at least pseudonymous. No place like home. Reward players who dream up backgrounds for their heroes by writing those into the town. Letting someone belong to the ruling family – or adding a building or guild that's part of somebody's story – doesn't automatically grant benefits but does provide adventure hooks. Welcome to . . . Lastly, name the town. This might reflect landmarks (Black River, Iron Mountain, Skull Island), surroundings (Deepwater, Sunny Dell, Northwood), important functions (Forge Hill, Greatport, Sanctuary), rulers' names or professions (Port Roberts, Smithton, Tannersham), or something it's famous for (usually something positive, if only a euphemism, to avoid "Murderville"). Then again, this is fantasy, so the outré is an option – why not "Murderville"? Translating names into other real-world languages can add a touch of the exotic, and there's always the fantasy fun of inventing names that just sound cool. Town planning is only one part of campaign planning. 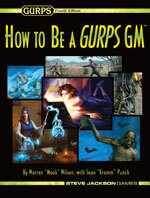 Fortunately, the Dungeon Fantasy Roleplaying Game is Powered by GURPS, so you can benefit from the advice in How to Be a GURPS GM as well.